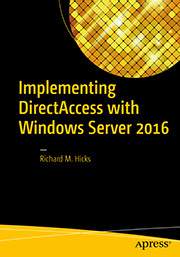 Windows Server 2012 DirectAccess Video Training Course Now Available | Richard M. Hicks Consulting, Inc.
Great training course Richard. I am just working my way though it now. I have a question I have to see covered anywhere. 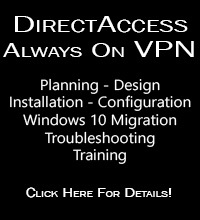 Is there any way, when using DirectAccess on Windows Server 2012 R2, to prevent a single user account from connecting to the network from concurrently from multiple windows clients? 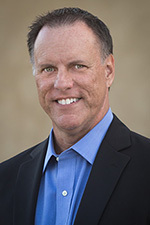 I realize that DA is computer based authentication but I wonder if there might be some other way (script, policy, otp, smartcard, etc) to prevent a user from doing this. This is a requirement for us. Thanks. Not that I’m aware of. It might be possible to do this with some of the advanced Active Directory features in Windows Server 2012 R2, but I’m not certain. Yes, you can configure strong user authentication using OTP for DirectAccess when configured with any form of load balancing, NLB or external.